I realize admitting this here means everyone on the planet who has internet access can know know this about me. Thank you for your concern. I prefer toilet paper to roll over the top instead of out from the bottom. When I come across a roll that is installed the wrong (in my opinion) way, I am not happy. I have fleeting thoughts of how the world might be a better place if we would all learn to install toilet paper rolls the right (in my opinion) way. I wonder why not every gets this fairly obvious (to me) fact. So, the last time I faced this particular traumatic moment, I realized that one of the first rules of living in community is that we must be willing to let go of things we are not willing to do ourselves. I am not claiming this is an absolute rule; there are certainly expectations and standards on some matters. Consider how much frustration we cause one another when we expect the same results from someone else on a task that we would refuse to do or ask them to do. Is there no room for training, or discussion, or negotiation? On the contrary; such talk is perhaps the thing we are really missing in our society. We lay expectations on one another without any talk about what our expectations are or where they come from. Roll your toilet paper whichever way you want. But I would appreciate it if one of you who prefers rolling from under to explain to me why. I also prefer over the top, however I have noticed something about that. As I prefer the over the top approach, I also am in a bit of a zombie mode when I pull off for paper. This can create an “over pull” and I get more than needed. I do not think much of it and move on with the process. However, with the “under the roll” set up, I have to think about how to rip the paper off more than when it is my “over the top” set up. This lends itself to me acquiring more appropriate levels of TP and thus reducing waste. So in our home, I have moved from a “over the top” exclusive position, to a “switch it up” position. 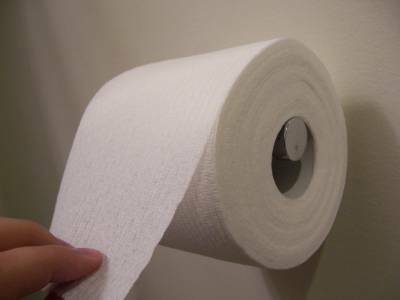 Whatever the roll was when it was finished, put the new roll on in the opposite direction. Keeping the brain in motion even on the throne. I like that: “Keeping the brain in motion even on the throne.” That’ll preach…. I’m sure that you mean for this post to be taken in quite lofty ways … BUT … could you please come to Caddo Mills and deliver this important message about LETTING THINGS GO YOU ARE NOT WILLING TO DO YOURSELF to your old buddy Doug? Thank you very much. I appreciate the invite, Kim, but I’m not stepping in between the two of you…. @ Jason: Try stepping on the roll (with a sock foot) before installing. It inhibits wild turns of the tissue. My friend puts his under. It drives me a little crazy which really isn’t that far, but still… Over the top seems correct to me and any other method just seems silly. We make peace by setting it on the sink – no rolling required. As far as communal living goes… there are no rules – and rarely any right or wrong answers… open communication must be the order of the day always. And if you can’t communicate then you probably shouldn’t live together. And if you must live together but still can’t communicate, you’ll probably need therapy or at least a mediator you can both/all agree on. You’ve reached a fine compromise! Are there really no rules for communal living? or just none exterior to those doing the living? I think sometimes “rules” sounds like something that needs enforcement and can encourage dogmatism, petulance, rebellion, resentment, etc. … living together is breathing together there should be a flow, respect, empathy, yielding, exchange … different people have different needs, different tolerances etc… Laws are exist for the people that would otherwise break them. If you live with someone that needs laws, then you probably don’t live with someone that has respect for others. Respect is what I would focus on with communal living – not so much rules. out the bottom is the only way to roll paper in my opinion. I have several very good reasons for this position. 1)as already stated over the top creates the massive problem of over pull. I want to conserve where I can, and while I am not a one square type guy, I don’t want to over sue TP either. 2) Under helps prevent animals and children from massive unrollings. I had a friend in HS who had cats. Cats tend to bat down on a TP roll. If it is coming over the top this will have the effect of unrolling the entire roll. If the it is coming out underneath, no paper is actually unrolled. Young children have the same tendency. It doesn’t take them forever to learn to go the opposite way, but it does delay and reduce the ‘unroll’ some. 3) Folding technique is made easier by the under method. I am a methodical person in some ways. I am a folder, and as such the underneath position makes this method much easier and generally more controlled. Just so you know Steve, I hope to room with you one day at a camp or something. Because I take the time to remove and readjust the roll to the underneath position. I used to be upset by this, now I just take it in stride and readjust it for my own personal use. I believe I recall hearing a report years ago that rolling out the bottom actually uses less TP, so I should try to convert. I’d enjoy the rooming together at a camp or some such event.